Joseph cut his teeth designing and building the many immense and complex structures at the Duke of Devonshire's estate, Chatsworth. With such wonderful structures in which to work, Paxton desired exotic plants to fill them. Expeditions were sent around the world with the sole purpose of acquiring rare and indigenous plants. The most important plant in Paxton's treasury of flora was the magnificent, even outrageous member of the Nymphaceae, Victoria regia. Paxton was the first to force a Victoria to bloom outside its natural habitat. The Victoria's pads and intricate infrastructure represent a bridge between Paxton's two great interest, architecture and horticulture, the culmination of which produced the Crystal Palace. 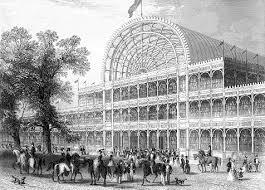 The Crystal Palace, the largest glass house ever constructed in England (it has since been surpassed by Stapeley's Palm House) was erected in London in 1851, and Sir Joseph Paxton was knighted that same year. 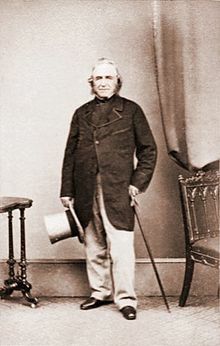 The most remarkable thing about Joseph Paxton was that he was a self taught man with little formal education. His genius was in bringing together two disciplines, Architecture and Horticulture, by converting his understanding and study of the Victoria leaves into practical architectural results, the forerunner of modern skyscrapers, pre-fabricated buildings and greenhouses. If you want to learn more, the June 1988 issue of the Journal, has an excellent piece written by Virginia Thomas Crum; Sir Joseph Paxton and His Inspiration.